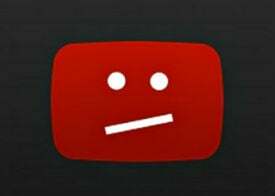 YouTube continues to crack down on sites and services that allow people to download videos from the site. 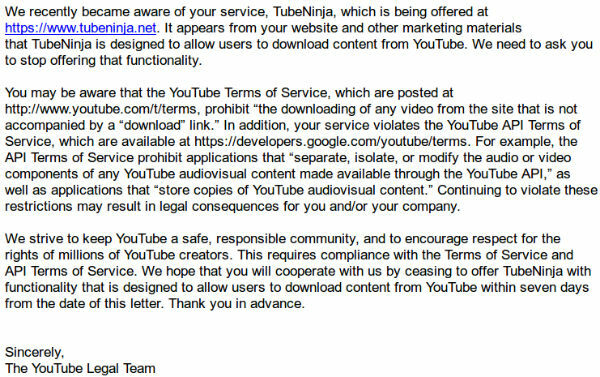 Most recently, YouTube urged the operator of TubeNinja to cease his activities, or face potential legal action instead. For now, however, the video download service has no plans to change its course. With over a billion users YouTube is the largest video portal on the Internet. Every day users watch hundreds of millions of hours of video on the site, and for many it’s a prime source to enjoy music as well. While YouTube is a blessing to thousands of content creators, there are also concerns among rightsholders. Music labels in particular are not happy with the fact that music videos can be easily downloaded from the site with help from external services. To address the problem YouTube is contacting these third party sites, urging them to shut down this functionality. Most recently, YouTube’s legal team contacted the popular download service TubeNinja. “It appears from your website and other marketing materials that TubeNinja is designed to allow users to download content from YouTube,” the email from YouTube’s legal team reads. According to YouTube the video downloader violates the terms of service (ToS) of both the site and the API. Among other things, YouTube’s ToS prohibits the downloading of any video that doesn’t have a download link listed on the site. Despite the threatening language, TubeNinja owner Nathan doesn’t plan to take the functionality offline. He informed YouTube that his service doesn’t use YouTube’s API and says that it’s the responsibility of his users to ensure that they don’t violate the ToS of YouTube and TubeNinja. “Our own ToS clearly states that the user is responsible for the legitimacy of the content they use our service for,” Nathan tells us. TubeNinja doesn’t believe that YouTube has a very strong case and Nathan has asked the company for clarification. He also mentions that Google’s very own Chrome service lists many plugins that offer the exact same functionality. “They don’t even seem to enforce removal of Chrome plugins that enable users to do the exact same thing,” Nathan says. “Also the fact that services like Savefrom, Keepvid, clipconverter etc have been around since 2008, we find it hard to believe that there is any legal case at all. Kind of like suing a maker of VHS-recorders for users taping the television broadcast,” he adds. In 2012 Google went after Youtube-mp3.org with a message similar to the one TubeNinja received, but despite these efforts the site remains one of the most used conversion tools with millions of visitors per day. “We decided to pause the functionality now and comply until we have some legal advice,” he informed us.